If you discuss great barbecue destinations in Texas, the conversation will typically begin in Central Texas around the barbecue hubs of Austin and Lockhart. Some might mention Dallas or Fort Worth as barbecue destinations and I have written with admiration about the burgeoning reputation of Houston as a top-tier barbecue city. But even with Houston, which has an assortment of exquisite barbecue, it has taken a while to garner that respect and claiming Houston as a barbecue destination is still a contested opinion. Victoria is a city that would have seldom come up in these barbecue conversations. That’s why I was surprised when I first saw talk of “The Great Coastal Texas Barbecue Trail” pop-up on social media a year ago. Still @coastaltxbbq received an instant follow from me on Twitter and I was obligated to do a little more research on this barbecue trail. Since then, I have stayed engaged with the happenings of the Trail through social media. Last week I had the opportunity to visit the Explore Victoria Visitor Information Center to chat with Joel Novosad and Bridgette Postel. Joel serves as Marketing Manager at Explore Victoria and is the man behind the social media and online presence of the Barbecue Trail. It was a joy to discuss the convergence of two of my interests; Marketing and Barbecue, while Joel and Bridgette were able to provide some anecdotes about the Trail. The Great Coastal Texas Barbecue Trail rolled out in May 2015 with seven stops; some I had visited (Mumphord’s Place, McMillan’s Bar-B-Q), some I had heard of (Aunt Jo’s BBQ, Uncle Mutt’s Bar-B-Que) and some I had not heard of at the time (KB’s BBQ, Quality Packers Smokehouse, The Fire Pit). The Trail was the brainchild of former Explore Victoria director Anthony Cordo who stressed the history and families these barbecue joints represented as well as the meats. Since the rollout, they have also added Buffalo Creek Barbecue to the Trail with plans to add more in the very near future. The payoff for visitors (other than a few plates of smoked meats) is an enticement as old as time: Offer people a t shirt and they lose their minds. 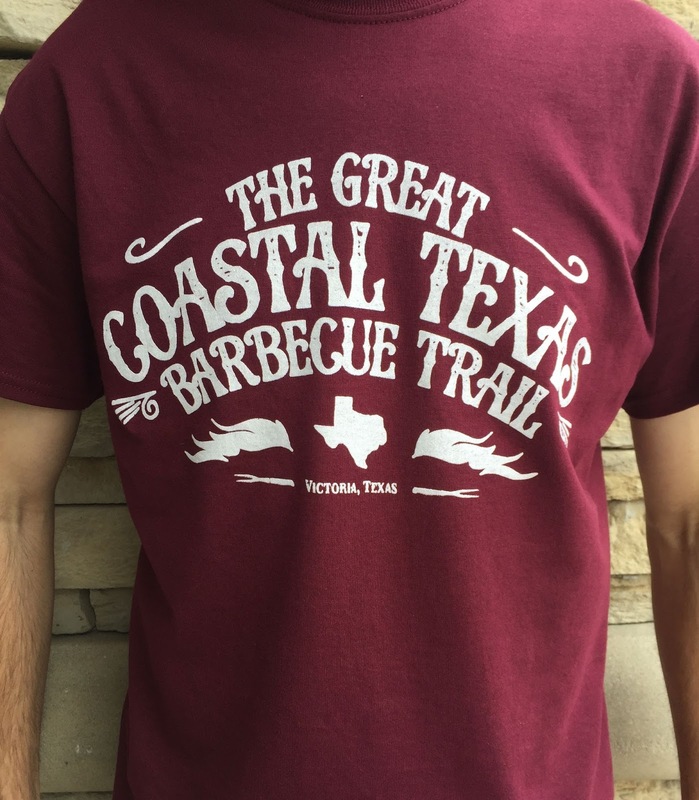 Submit three receipts from any of the listed joints to the Visitor’s Center and you will receive your own Great Coastal Texas Barbecue Trail shirt. 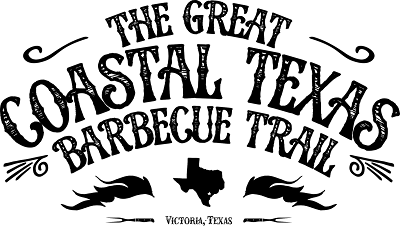 The creation of the Trail was very well calculated. Barbecue is something that Texans will travel for (as is the premise of my website) and this trail gives them an agenda and a reason to visit Victoria. Victoria’s proximity to Houston, San Antonio and Corpus Christi offers an easy trip for protein seeking Texans. If barbecue isn’t your only objective, the Trail offers three itineraries which mix in local sights and activities. Meanwhile what if a non-Texan walks into a Texas tourism information center with thoughts of that iconic Texas barbecue on their mind? There is only one pamphlet distributed in the state on the topic, so they will be handed information on The Great Coastal Texas Barbecue Trail. If anyone Googles “Texas barbecue itinerary” to plan a trip, the top result will send them to coastaltexasbarbecuetrail.com. The Trail has also landed in publications like "Food Traveler" which named it one of the best barbecue scenes in the nation. Through this branding, Victoria has quickly (and brilliantly) positioned themselves as a barbecue destination to anyone seeking. On my visit to the Explore Victoria Visitor Center, I was shown pictures of people modeling their shirts in far-flung places like Switzerland. They also had pictures of a couple that visited the Barbecue Trail as part of their anniversary. The concept of the Coastal Texas Barbecue Trail has succeeded in not only bringing attention to local barbecue joints and to Victoria in general, but it has also served barbecue seekers like myself by presenting us options that we may have missed otherwise. For example, Quality Packers Smokehouse originally appeared on my radar thanks to the Trail and last week, before swinging by the Explore Victoria office, I had the opportunity to check out the family run business. QP Smokehouse turned out to be a tremendous option and scored with all three meats that I sampled – brisket, pork ribs, and the housemade sausage. The Limon family is putting out some very good barbecue that deserves the press and I was pleased to have been directed there. QP Smokehouse would be notable barbecue in any of the “barbecue cities” I previously listed – but it is located in Victoria as a testament to why the Great Coastal Texas Barbecue Trail is such a good idea. This commitment toward an identity in barbecue goes beyond pamphlets and social media. This September at Bootfest, Victoria’s preeminent annual festival, the city will be launching a new attraction: the “Bootfest Barbecue Street.” This will be an entire street dedicated to barbecue and will feature local Trail joints and include competitions in multiple categories. This move shows that they are incorporating barbecue into the very identity of the city. Whether it is by their own merit or just good marketing, Victoria, Texas is now known as a barbecue destination. They have a nice collection of barbecue stops for a town of 65,000. I’m not claiming that Victoria has the most impressive barbecue scene, but they are the best marketed. With this marketing, Victoria is also improving the perception of South Texas barbecue and perhaps enticing more pitmasters to open up shop in this market. Expansion plans are already underway as QP Smokehouse looks to move to the iconic Corral Steakhouse location that went out of business last May. Lupe Limon of Quality Packers is also looking to branch out from the family shop and set up his own barbecue trailer. As the second year of the Trail progresses, we could soon be looking at 10 stops on the barbecue itinerary. While this growth may not be a direct result of the city’s marketing efforts, you can bet that the Trail will cover it and give us a tangible way to chart the city’s progress as a barbecue destination. Victoria is carrying the torch for South Texas barbecue. As a born and bred South Texan, I am very aware that we do not have a strong pedigree when it comes to Texas Barbecue and I am proud of what Victoria is doing. There is no doubt that you will see this idea replicated elsewhere (a similar Craft Beer Trail has already popped up in New Braunfels) as Victoria has established themselves as a best practice. But marketing can only sustain for so long. The bar has been set and scrutiny has been invited. As a self-proclaimed barbecue trail, it is now up to the public to determine if this trail is indeed worth traveling. In my opinion, it is a trip worth taking. I can attest that there are some jewels on this agenda. I would suggest beginning your trip with McMillan’s and Quality Packers which are can't miss stops in the area. 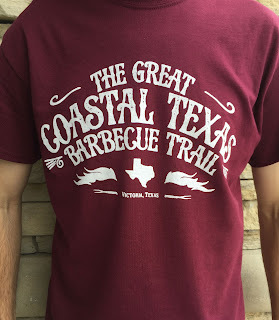 As for myself; although I already have the t-shirt, I still have some work to do if I want to complete The Great Coastal Texas Barbecue Trail – which I fully intend to do. As always, Twitter is the best place to follow my travels (@BBQAdventurer). You can also monitor the ever-popular Barbecue Roadmap as I chart my stops. I hope to see y’all on the trail, whether it’s in the Gulf Coast or elsewhere in the great State of Texas.